Previously officials said Tsarnaev was in no condition to be interrogated. Tsarnaev, 19, is being treated at Beth Israel Deaconess Medical Center in Boston, where he is listed in serious but stable condition, with wounds to the neck and throat area, according to sources. The bombing killed three, including a young boy, and wounded about 170. An MIT officer was allegedly killed by Tsarnaev and his brother Tamerlan and a Boston transit cop was badly wounded in a subsequent shootout. The FBI is still collecting evidence from the Monday's blast site, mainly from the sides of buildings and the bleachers. Boston Police Commissioner Ed Davis in a news conference Sunday that the circuit board to at least one of the bombs had wires crudely soldered to it and is confident ATF agents will put that bomb back together piece by piece and tell us what it was made of. Engineers are also checking the structural integrity of buildings near the scene before it fully reopens. Boston Police plan to start returning personal items to people who left behind their things on Monday. Boston Mayor Thomas Menino said it is time for the city to move forward. "I'm working hard over the last several days develop a plan to reopen Boylston Street now the most famous street in the world," Menino said at the Sunday news conference. Tsarnaev could face charges at the state and federal levels, but Massachusetts has no death penalty. Menino hopes federal authorities "throw the book at him," which would include the possibility of execution. "I hope that the U.S. attorney takes him on the federal side and throws the book at him," Menino said on "This Week." "These two individuals held this city hostage for five whole days." "They should not do that -- that's what these terrorist events want to do, hold the city hostage and stop the economy of the city." Menino said he agreed with the decision to shut down the city Friday because of multiple events, including the discovery of a pipe bomb unrelated to the marathon attack. "At that time we found a pipe bomb at another location in our city of Boston," he said. "Another individual was taken into custody." Menino did not elaborate on the pipe bomb incident. He said he believed the Tsarnaev brothers acted alone when they allegedly set off two bombs at the Boston Marathon finish line. He also said he thought that Tamerlan Tsarnaev, 26, who died after a gun battle with police, "brainwashed or manipulated" his 19-year-old brother, who was taken into custody Friday. It's unclear when Dzokhar Tsarnaev will be able to talk, but a special interrogation team is at the ready, sources said. He apparently knows that his brother died after a Thursday night gun battle with police, sources say. Authorities had launched Friday a manhunt for Tsarnaev, who managed to escape one block outside a police perimeter. 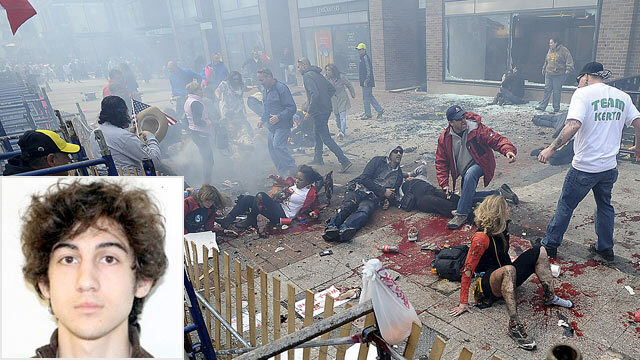 Residents of greater Boston were told to stay in doors, as police hoped to find and apprehend Tsarnaev alive. Authorities zeroed in on a boat in a Watertown, Mass., backyard after they received a tip from homeowner George Henneberry, who saw something was amiss. An infrared camera with a bird's-eye view of the moments before Tsarnaev's capture gave authorities an idea of what to expect as they methodically closed in on the Boston Marathon bombings suspect. Police believe Tsarnaev was initially wounded Thursday night in the gun battle that ended in his brother's death. Police said they found blood in a car he abandoned and blood at a house. The thermal-imaging camera showed Tsarnaev was able to move around inside the boat, as the FBI SWAT team brought in a robotic device to approach the boat and peel back a tarp, giving authorities a clear view of the suspect. At least two flash grenades were thrown into the boat, designed to disorient Tsarnaev, who authorities feared might have been wearing a suicide vest. They were then able to move in, rushing Tsarnaev to Beth Israel medical center for treatment, where he has remained under heavy guard. He was not wearing a vest. It was unclear whether he was hit by a final exchange of gunfire Friday. Tsarnaev is in the same hospital where his brother, Tamerlan, 26, was brought early Friday after a shootout with police. Tamerlan died of his wounds. Investigators, who are expected to include the country's elite counterterrorism unit, are hoping that Tsarnaev survives because they are intent on determining what triggered his and his brother's alleged involvement in the attack and whether they had any help. One focus of the probe so far is a six-month trip Tamerlan Tsarnaev took to the semi autonomous Russian province of Dagestan in 2012. Dagestan has become a hotbed of militant Islamic activity. The FBI acknowledged it interviewed Tamerlan Tsarnaev at the request of Russian authorities, but after looking at his phone records, websites he visited and associates, the FBI found he had no ties to terror. Zubeidat Tsarnaeva, the suspects' mother, said her sons couldn't be responsible for the Boston Marathon bombings because Tamerlan had been on the FBI's radar. "My son would never do this. It is a set up," she said. "He was controlled by FBI like for five, three, five years. They knew what my son was doing." After Tamerlan Tsarnaev had been checked out, FBI officials said the monitoring had to stop by law because they found nothing incriminating. "There are too many people in this country just like him that are touching extremist websites that are espousing things that aren't particularly kind to Americans. But that's not against the law here," ABC News consultant and former FBI special agent Brad Garrett said. After a week of tragedy, terror and living on edge, the greater Boston area is finally breathing a sigh of relief. "We got our guy and very proud of it and we want Watertown to back to normal; we want Boston to go back to normal," Watertown Chief of Police Edward Deveau told ABC News. On Sunday, Cardinal Sean O'Malley called on the people of Boston to return to the community. "It has been refreshing to see the generous and at times heroic response to the Patriot's Day violence. Out challenge is to keep the spirit of community alive," he said. Pictures of those killed were place on easels inside this cathedral and O'Malley said they live now in eternity. At a Red Sox game on Saturday, fans filled Fenway Park with their voices, singing "The Star-Spangled Banner" in unison. They applauded for law enforcement, they mourned the victims of the bombings and they showed their resilient spirit. "We are one. We are strong. We are Boston. We are Boston strong," the announcer said to an eruption of cheers. The Red Sox later pulled out a spirit-boosting win. And America hasn't forgotten about David Henneberry, the man who tipped police off that Tsarnaev was hiding in his boat. Bullets riddled the blood-stained vessel during a final volley of gunfire between Tsarnaev and law enforcement. Henneberry is being regarded as a hero, and people around the country are sending him checks to put toward a new boat. Deborah Newberry, 62, of Orlando, Fla., told ABCNews.com she mailed a $25 check to Henneberry's home. "Just listening to his coolness and how he handled the situation, it was like OK, that is a man who needs to have his boat restored," she said. ABC News' Pierre Thomas, Anthony Castellano, Aaron Katersky and Christina Ng contributed to this report.